Description: The grey gurnard is a relatively slender bodied gurnard with a sharply pointed snout. 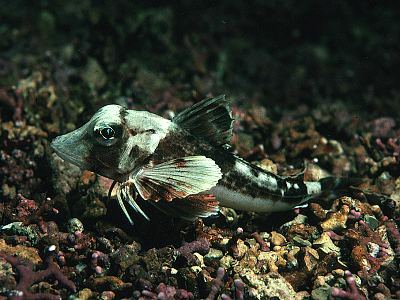 Like all gurnards it has a large head covered by protective bony plates and the lower three rays of the pectoral fins are separate and fleshy. Adult fish are usually around 30cm long but large individuals can be up to 45cm. The scales along the lateral line are sharply spined, although this is most conspicuous in small fish. The colour ranges from grey to greyish-brown with small whitish-cream spots and there is a characteristic dark blotch on the rear edge of the first dorsal fin. Habitat: This species is usually found on muddy or sandy seabeds or in areas of mixed sediment and rock. It is most frequently encountered at depths between 20-50m although it is known to occur from 10-200m. The diet consists of bottom-living crustaceans and small fish. Distribution: The grey gurnard is widespread all around the coasts of Britain and Ireland. Similar Species: Greyish coloured tub gurnards might sometimes be confused with this species however grey gurnards have a dark spot on the first dorsal fin and do not have blue markings on their pectoral fins. Picton, B.E. & Morrow, C.C. (2016). Eutrigla gurnardus (Linnaeus, 1758). [In] Encyclopedia of Marine Life of Britain and Ireland.